Provide comfort for the family of Ina Doyle with a meaningful gesture of sympathy. Lovingly remembered . . After a brief stay in the Foothills Hospital, Ina passed peacefully to her heavenly abode on Saturday, March 30, 2019. Born to George Llewellyn and Janet Margaret Davies, Ina grew up and lived as a farm girl with her three siblings Robert, Helen, and Shirley. She followed her sister Shirley in acquiring business skills before moving to Calgary where she worked at city hall as secretary to Calgary’s mayor. She then moved to a small oil company in 1955 as secretary to management and in 1963 after an extended trip to Europe she returned to Calgary, married (Harvey), and became mother to a family of four children (Maureen, Arlynne, Kevin, Clarice) – later to become five (Neville). In time, she welcomed, loved & enjoyed four grandsons (Lawrien, Dallas, Colton and Spencer). 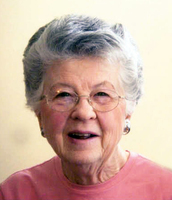 Her sacrificial life of service and faith extended to church and community as well as family and touched many lives. She was predeceased by her parents Robert Llewellyn (1966); his wife, Janet Margaret (1977); her siblings, L/ Corporal Robert Davies (1944 overseas), Helen (2007), and Shirley (2018), and daughter, Arlynne Doyle (2002). A Celebration of Ina’s Life will be held on Saturday, April 13, 2019 at 1:30 pm at Abundant Life Church (formerly Bethel Baptist Church), 3325 -49 St SW, Calgary. To view and share photos, condolences and stories of Ina, please visit www.choicememorial.com. We encourage you to share your most beloved memories of Ina here, so that the family and other loved ones can always see it. You can upload cherished photographs, or share your favorite stories, and can even comment on those shared by others.